Oriental Fruit Moth OFM -- 1st generation OFM flight starts: April 23, Saturday. 1st generation 55% egg hatch and first treatment date, if needed: May 27, Friday. 2nd generation OFM flight begins around: June 26, Sunday. 2nd generation - first treatment date, if needed, July 4, Monday. San Jose Scale (SJS) -- First adult SJS caught on trap: May 20, Friday. 1st generation SJS crawlers appear: June 15, Wednesday. Spotted Tentiform Leafminer STLM -- 2nd STLM flight begins around: June 14, Tuesday. Rough guess of when 2nd generation sap-feeding mines begin showing: July 3, Sunday. Optimum first sample date for 2nd generation STLM feeding mines is July 10, Sunday. • I'd be on the lookout for potato leafhopper (PLH) any day now. Threshold for tolerance is zero in new plantings, consult NETFMG for treatment options. • Obliquebanded leafroller (OBLR) treatment (Altacor, Delegate, Belt, among others, see NETFMG) should begin soon, but I would probably hold off until next week. • Pear psylla are still out there, but the 2nd generation of adults should be waning. Hatching eggs and the nymphs are what's going to be doing the dirty deed now. We had a report of some phytotoxicity on pears where oil was used at arguably too high a rate. Be careful with summer oil, use at no more than 1% (preferably 0.5%). Thorough coverage is necessary. Although repeated oil applications can be effective at manageing psylla, at this point in time I would have a tendency to rely on a systemic insecticide such as Movento or Sivanto (the latter preferred) as I believe it has a better chance of stomping out the pear psylla problem for the rest of this season. - Damage appears to be caused by native or endemic fire blight populations.Strikes have been detected in various planting ages and sizes. While fire blight can be brought in to an orchard on nursery trees, this does not appear to be the case in this situation. - For bearing trees with few strikes, copper should be applied as a protectant to protect infected and surrounding trees from secondary infection. And strikes should be pruned out at least 12” into healthy tissue. Cueva + Double Nickel has been used extensively in other regions without affecting fruit finish. It should be applied on a 7-10 day schedule until terminal bud set. - The bacteria is able to travel through the xylem of the plant. It may be present in healthy tissue, beyond where pruning cuts were made. Cankers may form on large limbs or trunks where pruning cuts were made. These will be difficult to see and prune out later this season, but are a potential source of inoculum during bloom next season. - Streptomycin application should be used after a storm event. The antibiotic will be effective immediately before or within 24 hours after a storm event including 1) trauma in the form of high winds or hail, 2) warm temperatures and 3) rain. It must be present to kill bacteria while wounds to the tree tissue are still open. - Streptomycin application should be limited to 1 application this summer.Repeated applications can lead to development of streptomycin resistant bacteria. Despite label recommendations (up to 6 applications post boom), you should make every effort to limit applications to 1 spray. • Irrigation. It's still dry. According to the NEWA Apple Irrigation Model, the Water Balance (gallons/acre ) for a mature tall-spindle apple orachard is currently -32, 846 gallons. By June 27, it's predicted to be -48,294 gallons per acre. That means I would have to turn the trickle irrigation on for nearly three days straight to make up that deficicit (including the rain predicted for this Thursday.) We have not seen it this dry in some time, turn on the water if you have it. • Tree training and pruning. Not too late to strip leaders and finish up any errant apple tree pruning. Time to turn to peaches: remove big wood shading the interior of the canopy; remove vigorous, upright shoot growth; just try to open up center of tree so some filtered sunlight enters. • Hand thinning. Apples should be hand-thinned ASAP now to reduce crop load (where necessary) and improve return bloom for next year. The earlier the better on the latter, althoug I have to wonder how big a problem return bloom is going to be next year? Still, June drop is pretty well over so you can hand thin where necessary. 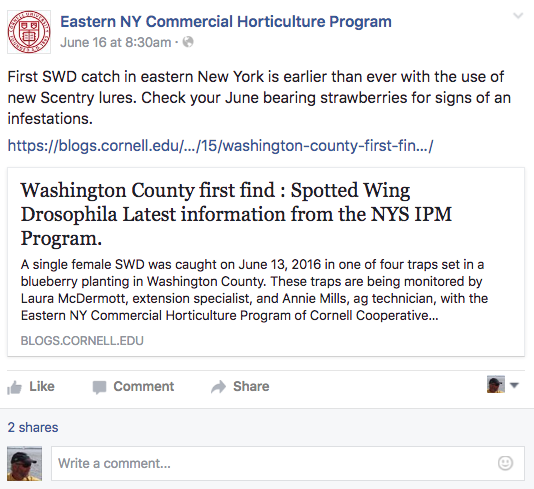 Nice entomology/insecticde update from Dean Polk at Rutgers University. The next Healthy Fruit will be published on Tuesday, June 28 (or thereabouts), 2016. As always feel free to get in touch with any member of the UMass Fruit Team (http://extension.umass.edu/fruitadvisor/team-members) if you have questions or comments.